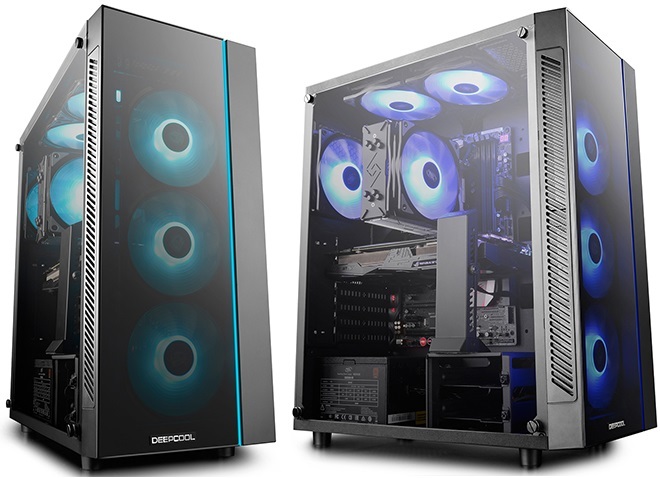 DeepCool announced the launch of new budget friendly chassis, the MATREXX 55. Despite being low cost, the chassis is made of 0.6 mm thick steel compatible with E-ATX motherboards, features a tempered glass panel of 4 mm thickness both on the side and on the front, and includes an RGB Sync connector to centralize all RGB LED lighting system (fans, strips, etc). With dimensions of 523 x 277 x 514 mm, this chassis allows the installation of two external units of 3.5 “/2.5” with four of 2.5 “, we can install a CPU cooler of very high range thanks to the 168 mm height available, a total of three graphics cards of up to 370 mm in length. The chassis doesn’t not include any pre-installed fans but supports 3x of 120/140 mm in the front, 2x of 120/140 mm at the top and one rear of 120 mm. The Matrexx series of cases will be available in September 2018 for $39.99, a pretty good price due to the quality of construction. The only downsize is no pre-installed fans, but that has an easy and economical solution.